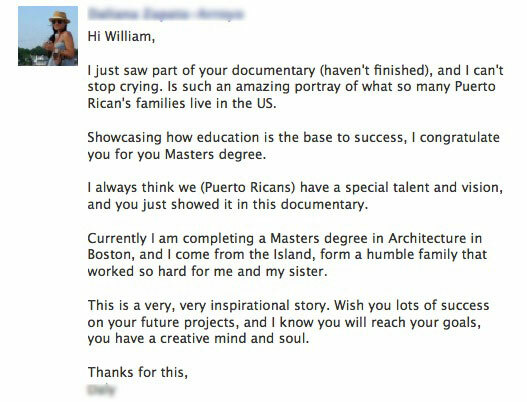 AMERICAN DREAMS DEFERRED is a feature length documentary about the life of Caballero's Puerto Rican American family who currently live in North Carolina, and his visits to see them from New York City during my last year of college. Shot in cinema verité style, and blending diverse forms of animation, it tracks each of my family members as they struggle with various financial and health problems ranging from diabetes, kidney failure, drug addiction, and HIV. The documentary was chosen for the 2008 Latino Producers Academy held in Santa Fe, New Mexico, went on to receive the first annual HBO-NALIP (National Association of Latino Independent Producers) Documentary Grant in 2009, and premiered at the 2010 NEW YORK INTERNATIONAL LATINO FILM FESTIVAL. The above video features the documentary in its entirety as appeared on national television on the show AMERICA REFRAMED. Click here to see a trailer. In September 2012, the documentary was chosen to premiere in the debut season of AMERICA REFRAMED, a documentary series that looks into the changing landscape of American culture. Caballero was interviewed for the program with show host Natasha Del Toro, and the show debuted on the PBS WORLD CHANNEL on December 30th, 2012. In 2009, the documentary was the solo recipient of the first annual HBO-NALIP (National Association of Latino Independent Producers) documentary grant in the amount of $10,000. Click here to see the newsletter announcing the documentary as the winner.